Music can be found around every corner in Downtown Nashville and beyond. Music of every genre can be heard in and around "Music City USA". As bar schedules are set, we will try to cover them here for you. You never know where the next "superstar" will emerge. Who knows? With all these "celebrity" bars/restaurants popping up, you could just run into your favorite singer. Click on Location to view events for that venue or simply scroll down to see all. Click on the Artist's name (when available) to learn more about them and listen to their music to plan out your days. The lists may not be complete. Check with the venue for the most up-to-date schedules. All schedules are subject to change without notice. 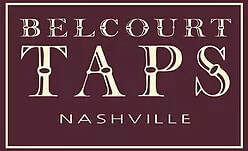 Located in the heart of Nashville's Hillsboro Village, Belcourt Taps offers a down-to-earth experience for food, drink and music lovers alike. Their diverse menu, wide selection of local brews and firm commitment to booking some of the best songwriters in Music City ensure a great time for both travelers and locals.